The tools are coming to Android phones, but not iPhones. Google wants to make Android phones powerful tools for people who are deaf or hard of hearing. On Monday, the search giant released two new services, Live Transcribe and Sound Amplifier, aimed at helping people who have trouble hearing communicate more easily. 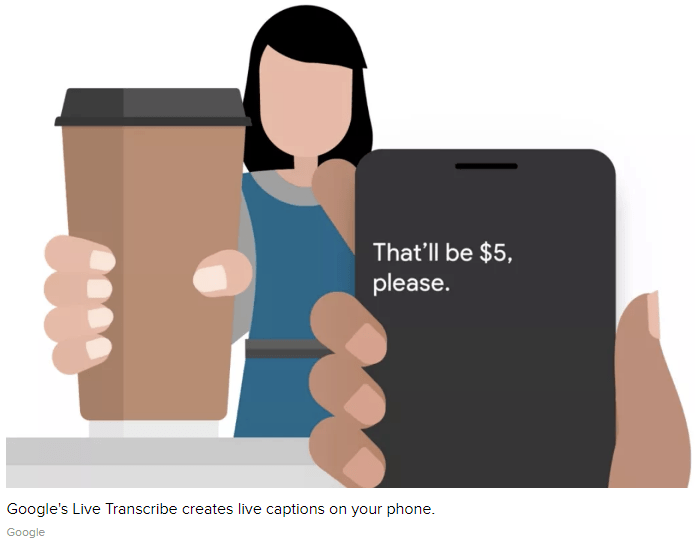 Live Transcribe does exactly what its name suggests — it uses your phone’s mic to automatically generate captions that appear on your screen. With Sound Amplifier, you can use your phone and a set of headphones to improve the clarity of the speech around you. Live Transcribe is available in 70 languages. Hearing loss is a significant problem around the world. More than 5 percent of the world’s population, or 466 million people, suffer from disabling hearing loss, according to the World Health Organization, which uses a measure of sound intensity to define the condition. Nearly 35 million of them are children. The release of Live Transcribe comes as Google leans heavily on natural language processing and machine learning for its new projects. Last month at CES, the world’s largest tech showcase, Google unveiled Interpreter mode, which allows its Google Assistant to do live translations for two people speaking different languages. While Live Transcribe also focuses on language processing, it isn’t the first to do so. Microsoft demoed a live transcription tool at its Build conference in May. And an app called Otter.ai does live transcription of recordings. When you launch Live Transcribe, it automatically begins to transcribe any speech the microphone on your phone picks up. If you set it to dark mode, it writes out the words in large white letters over a black background. It transcribes more than 70 languages, including Portuguese, French and Swahili, and the software can switch between two of them at a time. If someone wants to type a response, rather than speak it, there’s also a keyboard tool. Sound Amplifier lets you manipulate how you hear the sounds around you. When you close the app, the transcript goes away. There’s no way to save conversations, and Google says they aren’t stored on its servers. You can also connect the phone to an external mic to improve the accuracy of the transcription. For the service to work, you need an internet or cellular connection. One of the project leads for Live Transcribe is Dimitri Kanevsky, a Google research scientist who has been deaf since he was a 1-year-old. “For the first time, I could talk to my two granddaughters who are 6 years old,” he said during the demo. Sound Amplifier, first announced in May at Google’s I/O developer conference, requires an Android phone and headphones. It isn’t a standalone app, but a tool you can access in your settings. It lets you manipulate the sound around you by moving slide toggles on your phone. 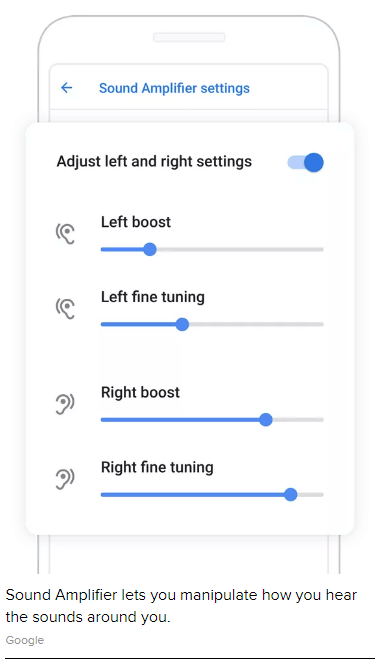 You can boost sounds or experiment with different fine tuning settings to reduce unwanted noise nearby. It isn’t meant to be as effective as an actual hearing aid or other medical device, but it could be a good backup if someone forgets their aid, says Brian Kemler, a program manager for Android Accessibility. Or it could be helpful in a loud restaurant or other crowded place, he said. While Google’s new Live Translator and Sound Amplifier are welcome additions to Google’s suite of Android tools, they aren’t failure-proof. For example, the natural language tools that power Live Transcribe are impressive, but they can get words wrong. And when multiple people speak, the text shows up in one big block, instead of separating the text by speaker. Google said it’s working on improvements for the app. ← Deaf Celebration Expo 2019 – Booth Sign Up now open!